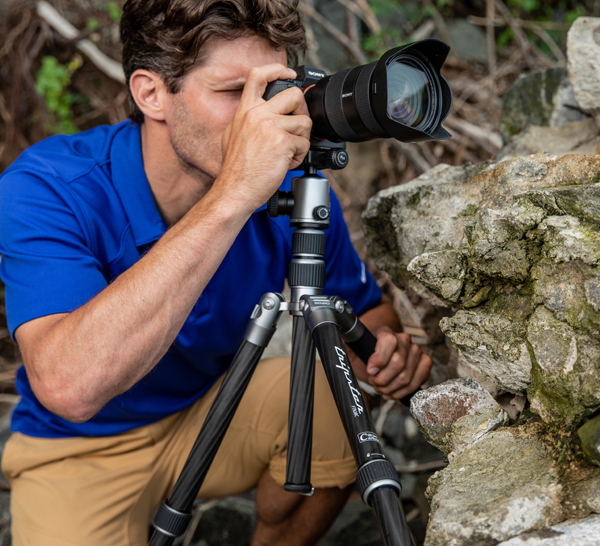 Today, Benro announced the availability of Tripster, a reverse folding travel tripod that also converts to a monopod. Tripster easily converts from a tripod to a full size monopod by combining one of the legs with the center column. The Arca-Swiss style ballhead is attached via a 3/8"-16 stud which can easily be removed. A 1/4"-20 mount on the tripod shoulder is ideal for attaching additional accessories. A Carrying bag is included. Converts to Monopod - The center column connects to the tripod leg to form a full size monopod. Removable Ballhead - The ballhead is attached via a 3/8"-16 stud and can easily be removed. Telescoping 2-Section Center Column - The column can be extended for additional height. Accessory Mount - A 1/4"-20 accessory mount is located on the shoulder for attaching additional accessories. Arca-Swiss style camera plate - This camera plate will work with most other Arca-Swiss style heads. About Benro: Originally founded in 1996 as a cooperative tripod manufacturer, Benro developed and began marketing its own brand name - Benro Professional Tripods and Heads in 2002. Since that time Benro Precision Photography Industry Co. Ltd. has received numerous accolades and awards for product and design features. Benro continuously strives to develop lighter, stronger and more versatile products to meet the needs of the most demanding professional photographers and filmmakers. The Benro mission is simple: to design and build products that exceed the needs of demanding photographers and filmmakers worldwide. Benro (http://www.benrousa.com) products are exclusively distributed by MAC Group (http://www.MACgroupUS.com) in the USA.